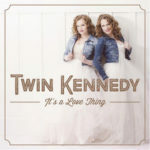 It’s only been 10 years since sister duo Twin Kennedy graduated from the School of Music, but during that short decade, the acclaimed country/roots duo already released two albums, toured across North America, moved to Nashville and won the hearts of country radio and fans alike. Now, the sisters are headed back to UVic on February 5th to be honoured among UVic’s 2018 Distinguished Alumni Award winners — an award that’s doubly special this year, given the School of Music’s 50th anniversary. Know for their distinctly “Canadiana” country roots sound, seamless harmonies and heartfelt songwriting, Carli and Julie Kennedy (BMus ’08) are the latest recipients of the Distinguished Alumni Award for the Faculty of Fine Arts. Each year at Alumni Week, UVic’s Alumni Association — in partnership with the universtiy’s faculties and divisions — present Distinguished Alumni Awards to outstanding members of the alumni community. The recipients are selected by their respective faculties or divisions based on a number of criteria, including career accomplishments or service to their community. Twin Kennedy now join the ranks of previous Fine Arts Distinguished Alumni Award winners, including visual artist Althea Thauberger (MFA ’02) director Glynis Leyshon (BFA ’73), author Esi Edugyan (BA ’99), lighting designer Michael J. Whitfield (BA ’67), filmmaker Mercedes Bátiz-Benét (BFA ’02), poet Carla Funk (BFA ’97), musician Paul Beauchesne (BMus ’88), author Deborah Willis (BA ’06), environmental designer Valerie Murray (BA ’78), author Eden Robinson (BFA ’92) and visual anthropologist Andrea Walsh (BA ’91). Twin Kennedy will be performing a free, on-campus show as part of the Orion Series in Fine Arts during Alumni Week: their intimate, acoustic concert at Felicita’s kicks off at 8pm on Wednesday, February 7, and is already almost sold out. Reserve your free tickets now. And you can read more about them in this Feb 1 Black Press article. 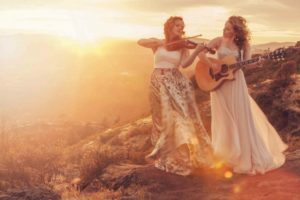 Originally hailing from Powell River, the twin sisters specifically chose UVic’s School of Music to study for their Bachelors of Music, with Carli focusing on classical guitar performance and Julie on violin. “We didn’t plan it, but guitar and violin go really well together,” says Carli. 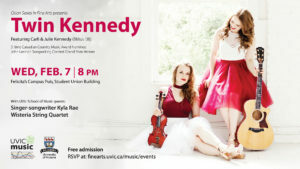 Beyond focusing on their individual instruments, the Kennedys were also instrumental in the development of UVic’s Vocal Jazz Ensemble, which is still very active today, under the guidance of Wendell Clanton. “He created a directed study for us, and helped to build the whole vocal jazz program—we were the first year of that,” says Carli. “He really encouraged us to try some really out-of-the-box stuff, which is a big part of what we do now,” agrees Julie. Victoria had an impact on the Kennedys beyond their studies, however, resulting in their family moving to “this beautiful city” and their sister Katelyn choosing UVic for her Education degree. “Where you go to school can really change your life in ways you never even realize,” says Julie. For his part, Dunn isn’t surprised by their success. “I know their dedication and hard work have afforded an unshakable musical foundation,” he says. “I am proud of their accomplishments and will always regard the Kennedys with great fondness and admiration. Perhaps because they are twins, there’s a clear connection between the two sisters that goes beyond both the personal and professional. (“And we are actually twins—which we got asked recently—although it’s pretty obvious,” laughs Julie.) They frequently finish each other’s sentences, and never hesitate to chime in with additional details. “It’s only with Carli that I could do this, and I couldn’t do this without her,” Julie admits with a smile. 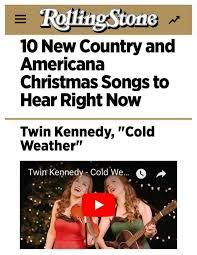 With a steadily growing amount of industry recognition — including multiple nominations from the Canadian Country Music Association (three) and the BC Country Music Association (12) — Twin Kennedy have also already won two John Lennon Songwriting awards for their song “Secondhand Gold,” which picked up the Grand Prize (Country) in 2015 and Best Country Song in 2016, as well as a pair of Vancouver Island Music Awards (Country Album of the Year). 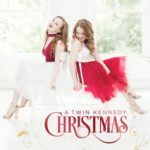 But it’s their roots in classical music that continue to set Twin Kennedy apart. Combining classical training with country roots allowed them to not only establish their signature sound and unique live show, but also develop their unique “Classical to Country Workshop” geared towards young musicians. 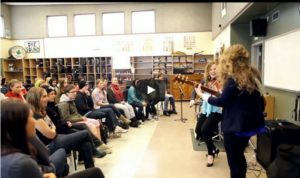 By visiting elementary schools, high schools, and community music programs, Carli and Julie help music students craft their skills and find their confidence on stage. As part of Alumni Week, Twin Kennedy will also be visiting the School of Music and sharing their experiences as recording and touring artists with the likes of the “Business of Music” class. Now based in Nashville, the sisters feel they’re getting “a Master’s degree in songwriting” just by living there. When asked for advice for current students, the Kennedy’s stress the importance of what students are actually doing right now. “People ask what we do for fun, and . . . we do this,” laughs Carli. “We really are,” Julie agrees. 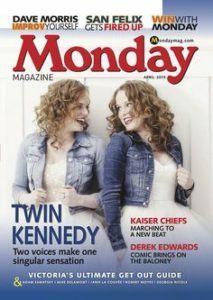 And if the School of Music can keep producing talents like Twin Kennedy, then so are we. Following their homecoming in February, Twin Kennedy will be hitting the road once again for a US tour in March. Keep a close eye on their social pages for further updates.